Fish are dying, wildlife is dying, the entire web of life is dying, but willful denial of verifiable realities continues to thrive. The global fish die-off is already beyond catastrophic, but the “experts” seem to have little to offer in the way of answers. Why? Because those in power are largely in control of the chess board, at least for the moment. Those who print the money (the bankers) control militaries, countries, and every imaginable institution down the line. How can we expect the paid “experts” to disclose the true severity of what we collectively face (and the true causes behind the converging catastrophes) when their paychecks and pensions almost always depend on them not disclosing the whole truth? Those who are truly in the know and thus in a prime position to sound the alarm face much more dire consequences than the loss of their employment. 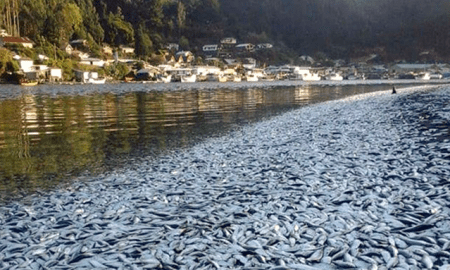 In regard to the global fish die-off, what don’t we hear from the “experts” and the media? That the oceans (and fresh water lakes) are rapidly heating along with the rest of the planet. That this heating de-oxygenates the water and fuels algae blooms which further de-oxygenate the water. We don’t hear that warming oceans are causing mass deposits of formerly frozen methane to thaw and release, also contaminating and deoxygenating oceans. And we certainly never hear a word from the “experts” about the ongoing climate engineering assault that is exacerbating the now runaway warming (in addition to contaminating the entire planet). Of course, we also never hear about the military’s other devastating activities that are slaughtering marine life, or about the military’s willingness to lie about their actions. And about Fukushima, yes, it is a catastrophe for the seas (and the planet as a whole), but there is much more to story in regard to the fish die-offs. The bottom line is that the vast majority of media sources (even “independent” sources), are only telling half-truths at best. First, about the rapidly accelerating global fish die-off, the excerpt below is from a report that was just posted by Michael T. Snyder from “The Economic Collapse” website.